Apartment Therapy is one of the sites that we enjoy reading here at Unclutterer. Their small space solutions are a helpful resource for those of us who live in tiny apartments and more “compact” homes. 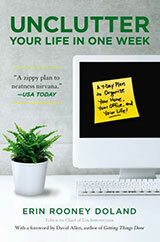 Their budget-friendly tips are great for those just starting out on their own or living in more expensive cities. 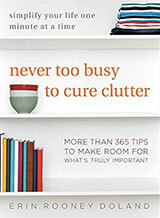 Read through The Big List to get great ideas on how to maximize space in homes of any size. There are tons of solutions, photos, resources, and storage ideas. Get inspired by taking a look at some of the ideas and products that they highlight in their year-end review. Apartment Therapy posted a question from one of their readers about displaying holiday cards. They feature a couple of options from Pottery Barn (no longer available) that cost $50! My wife’s solution cost under $6. 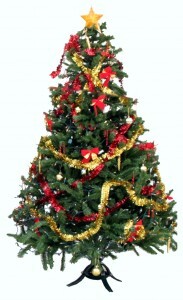 There are a few Christmas specific holiday card holders available at a relatively reasonable cost of about $20. If you have the space to store them, it could be an option. 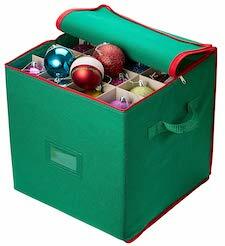 For those that are looking for something they can use all year-round, then consider a display that holds photographs most of the year and holiday cards during holiday seasons. The option my wife implemented displays the cards while keeping them out of the way. It is also cheap and, most importantly, simple. 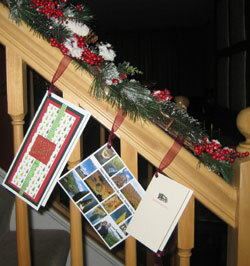 How do you display holiday cards in your home? Feel free to add your ideas in the comments. Do you have FOMO (fear of missing out) because you can’t post photos of your coffee on #latteart on Instagram? 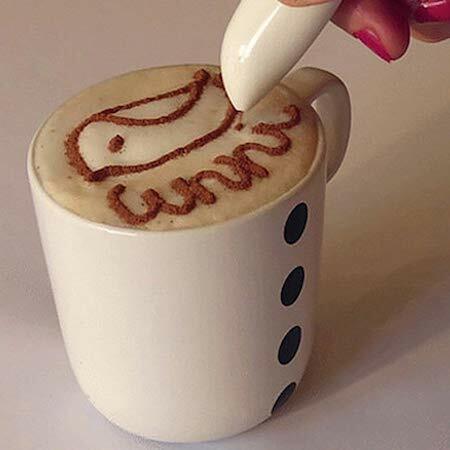 Now you can join in with this easy-to-use battery powered latte art pen! Don’t worry about this gadget being constructed of plastic and non-recyclable electronics because it dispenses natural, wholesome powder compatible with foods such as cocoa, cinnamon, and other spices. Just open the pen and pour in your cinnamon or cocoa powder. You must pour very carefully because the battery compartment is exposed when you open the cover. Any powder spilled in the compartment may interfere with or corrode the connections. 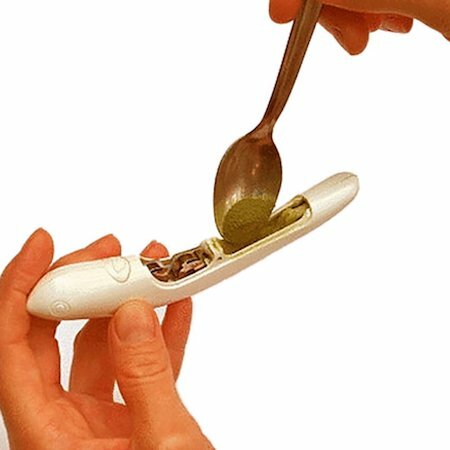 When you push the little button, the pen vibrates and the powder is supposed to flow out the tip. Once you figure out how to clear the consistent clogging, you too will be able design amazing art on your coffee and post photos of your food to all your favourite social media sites. Thank you to reader Olivia for bringing this unitasker to our attention — and for letting us know you saw the ad for it on (where else) Instagram. My Generation Z children are home from college for the holidays. We’ve had some good conversations about life when I was in college compared to their life now. Many things have changed. While they are lamenting the slow Wi-Fi on campus, I told them how I bought a 40MB internal hard drive for my 286 computer to run the statistics program for my thesis. Next year will be a busy year for our family. My husband and I will be moving wherever the military sends us. The oldest will be finishing college and moving to wherever a new job takes her. The youngest will be moving out of the dorm and into her own small apartment. While talking about all of these moves, we got into a discussion about stuff, uncluttering, and what the Generation Z wants and doesn’t want. Here are highlights of our conversations. Make it digital. Gen-Zers have no use for DVDs and CDs. They use streaming services like Amazon Video. They might want hard copies of select reference books or storybooks they read as children, but they would rather use a Kindle e-reader for everything else. An ideal holiday/birthday/wedding gift would be digital copies of home movies and family photos. Less housework is better. Dusting and polishing silver takes effort, but Gen-Zers will do the work if they value and can use the items. They have no use for the figurines and silver-plated coin-banks I received for them at baby showers. Nor are they interested in Grandma’s good china that is neither microwave nor dishwasher-safe. However, they would value one or two serving pieces like the sugar bowl/creamer set, the gravy boat, or serving platters. Only ‘my’ memorabilia. Gen-Zers have no use for the lobster trap their parents brought home from New England or the sequined sombreros from Mexico. They will keep items that are significant to them or that have important family history such as military medals, specific jewellery pieces, and artwork. Functional furniture. Large antique dressers with drawers that don’t open easily and oversized sectionals do not fit into the Gen-Zers lifestyle. They want smaller-scale, furniture that can serve more than one purpose such as end tables with storage and ottomans that double as filing cabinets. What does this all mean for the parents of Generation Z? Keep things because you love them and want them. If you are not enjoying certain things, ask your children if they want them now or will want them in the future (assuming they are old enough to make those decisions). If the children are able to take the items now, let them go. If not, make sure your final wishes are clear to avoid family disputes. 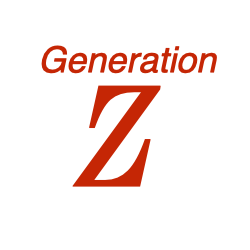 If you are in the Generation Z cohort or have Generation Z children, chime in with your opinions in the comments. My home has been cat free for eight months now. It wasn’t by choice. Our two cats passed away within a year of each other and we are waiting until our daughter is a bit older to get a new kitten. I definitely miss having a cat, but one thing I don’t miss is cleaning up cat hair all the time. It is a never-ending task! We are currently awaiting the possibility of cat-sitting for my in-laws when they travel to Florida for the winter. My daughter will absolutely be thrilled with this, and I must admit that I’m excited to have a cat in the house again. After my initial excitement, the next thing I thought of was the return of cat hair. It is definitely a negative aspect of owning a pet. Dogs aren’t much better in this regard, so I’ll include them in this post. My mom spent many hours vacuuming up black hair from her carpets from the Labrador they had years ago. Grooming: Brushing your pet regularly will decrease the amount of hair that ends up on the floor and furniture. You may also look into a corner comb. Furniture and Floors: Vacuuming regularly is a must. It doesn’t matter if you groom regularly, the hair will find its way to the floor and furniture. You may want to instill a no furniture rule for your pet to curb furniture fur. Clothing: The lint roller is a necessary evil if you plan to exit the house hair free. Also, don’t leave clothes out on the floor. Most cats love to lie on clothing left on the floor. Erin’s post on Taming pet fur tumbleweeds. The Furminator de-shedding tool will definitely be something we purchase. How about you? What do you do to keep pet hair from taking over your home? 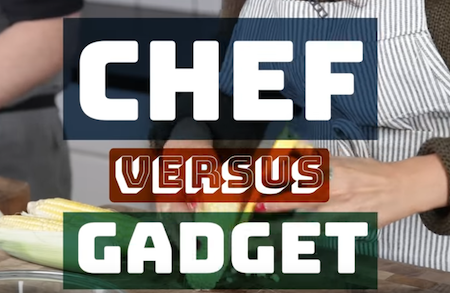 A big thank you to reader Celeste who sent us this video where a chef competes against unitasker gadgets. The video shows that a chef knife wins spectacularly over the unitaskery avocado cutter and corn cob peeler. There was a tie between the chef knife and herb cutter (only for the green onions). If you already have a knife, sharpen up your cutting skills and skip buying the herb cutter? The rapid egg cooker and the microwave pasta cooker, both unitaskers, won against the chef. How did they do that? They saved time — and likely saved energy. The rapid egg cooker does not require an entire pot of water to be boiled on the stove. The pasta cooker uses the microwave to boil water which is much faster and more energy efficient than the stove top. Both the pasta cooker and rapid egg cooker might be useful for students living in dorms who only have access to a microwave and an electrical outlet. Thanks again Celeste! It’s a great video. Note: Our post links to a microwave pasta cooker with higher Amazon reviews than the one shown in the video.